This is an entertaining and fairly level headed “what the future will bring” piece. It covers the promise and perils of a pretty diverse set of topics: nuclear power, space travel, power transmission, aviation, food production, urban growth, race relations and even (sort-of) outsourcing. The world has made vast strides in the last 75 years; even greater triumphs lie ahead if mankind has the courage to go on with the job. 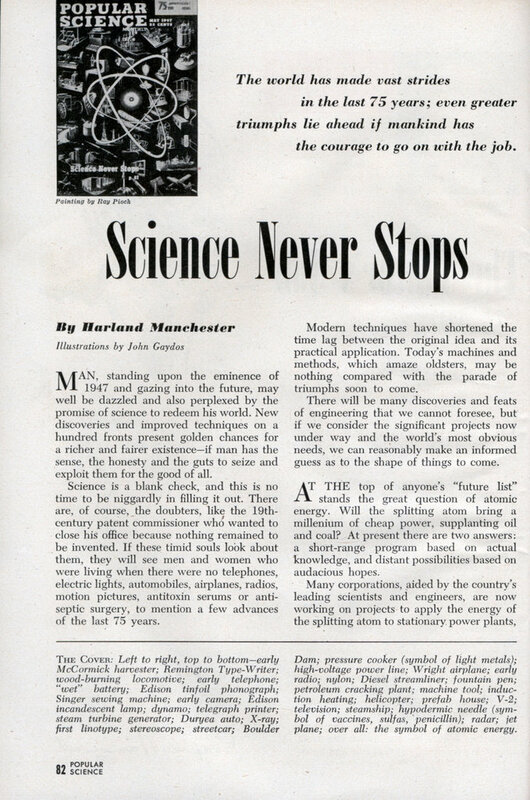 MAN, standing upon the eminence of 1947 and gazing into the future, may well be dazzled and also perplexed by the promise of science to redeem his world. New discoveries and improved techniques on a hundred fronts present golden chances for a richer and fairer existenceâ€”if man has the sense, the honesty and the guts to seize and exploit them for the good of all. Science is a blank check, and this is no time to be niggardly in filling it out. There are, of course, the doubters, like the 19th-century patent commissioner who wanted to close his office because nothing remained to be invented. If these timid souls look about them, they will see men and women who were living when there were no telephones, electric lights, automobiles, airplanes, radios, motion pictures, antitoxin serums or antiseptic surgery, to mention a few advances of the last 75 years. Modern techniques have shortened the time lag between the original idea and its practical application. Today’s machines and methods, which amaze oldsters, may be nothing compared with the parade of triumphs soon to come. There will be many discoveries and feats of engineering that we cannot foresee, but if we consider the significant projects now under way and the world’s most obvious needs, we can reasonably make an informed guess as to the shape of things to come. 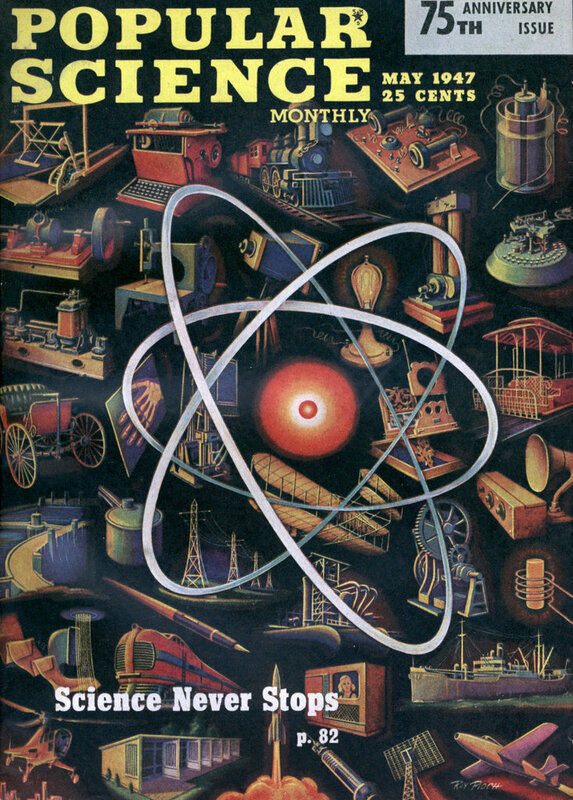 AT THE top of anyone’s “future list” stands the great question of atomic energy. Will the splitting atom bring a millenium of cheap power, supplanting oil and coal? At present there are two answers: a short-range program based on actual knowledge, and distant possibilities based on audacious hopes. Many corporations, aided by the country’s leading scientists and engineers, are now working on projects to apply the energy of the splitting atom to stationary power plants, ships, guided missiles and planes. Atomic power plants at Hanford and Oak Ridge will be in operation within a year or so. That project is simple. Heat and power are interchangeable, and every hour the Hanford pile turns out heat equal to that obtained from burning 7,100 gallons of fuel oil or 38.5 tons of coal. This heat can be used to make steam to drive turbines, or, more efficiently, to heat mercury vapor that will drive a turbine and then make steam to drive a second turbine. This mercury-steam combination (now used in coal-fired plants in Kearney, N. J., Hartford, Conn., and Schenectady, N. Y.) is the only prime mover known that gets as much power from its fuel as the Diesel, long the yardstick of superior efficiency. It may be still better to use the heated air from the pile to drive a gas turbine of the closed-cycle type, in which the hot air constantly recirculates, and heat wasted through the exhaust in the open-type gas turbine is used to make more power. Since radioactive air may eat away the turbine blades, helium, which cannot be “poisoned,” may be used in this efficient engine. That brings us to one of the greatest problems of atomic powerâ€”radiations that cause falling hair, sterility, wrecked red corpuscles and often lingering death. A wad of paper will stop all the charged particles caused by nuclear fission, but two uncharged criminals â€”gamma rays (akin to X-rays) and neutrons â€”must be caged by heavy shields of lead, concrete or other dense material. Nuclear physicists all over the world are seeking a lighter, more compact shield. We can reflect heat radiations with a thin sheet of aluminum instead of absorbing them with bulky insulation, and we can bend light rays in a lucite pipe and send them back where they came from. If these facts offer any clues, we can be sure that they are not being neglected. Until lighter shields are discovered, atomic power as we now know it can be used only in stationary power plants, ships, locomotives, rockets and pilotless planes. There is no evidence yet that it will be much more economical than power methods now used, but it might bring all the blessings of a TVA to a region without coal or water power, and it might enable an aircraft carrier to circle the world a few times without refueling. So far, our atomic power has come from smashing the heavy atoms U-235 and plutonium, but the sun gets its power by combining little atoms of hydrogen into bigger ones of helium. Man may learn to do this, with an increase in power of about 1,000 percent. Or scientists now investigating the cosmic ray in this country and in Russia may learn its trick of disintegrating hydrogen atoms. No one can scoff at the notion that some day the world’s work may be done by atomic-power engines of sizes suitable for every job, fueled by elements that are abundant and cheap. In any event, science will press toward that goal. We have entered the lair of the atom, God help us, and the door is locked behind us. There is only one way to go. WHILE we are waiting for atomic power, scientists and engineers will have their hands full perfecting new fuels for our present motors as the oil wells run dry. The world’s petroleum supply is definitely dwindling, and new deposits will be increasingly expensive to work. But we have enough coal for an estimated 2,500 years, and from coal and natural gas, as the Germans have shown, we can obtain gasoline and Diesel oil, as well as by-products of fuel gas and alcohols. Coal, the orphan of research, will soon come into its own at the hands of the “long-haired professors” whom the shortsighted mine operators long disdained. For several years a toy refinery has been operating in the laboratories of the Bureau of Mines in Pittsburgh. Coal goes in at the top and gasoline trickles out at the bottom. Now two full-scale plants are being built in Texas for making motor fuels from natural gas by the more efficient Fischer-Tropsch process. The next step is to use coal to make the gas to make the gasoline, and several big oil companies are spending large sums in research to have this method ready when it is needed. The cost of gasoline from coal abroad has always been high compared with U. S. filling station prices, but improved methods of making cheap oxygen (developed by Dr. Kapitza, of Russia; MIT, and M. W. Kellogg and Co.) will help in making synthetic fuels at prices we can pay. You don’t have to turn coal into oil to provide a convenient fluidlike fuel. You can pulverize it as fine as face powder and blow it into the combustion chamber of a gas turbine. Perhaps tomorrow’s Iron Horse will grind up any cheap coal, burn it, remove the fly ash, and spin a turbine with the hot gas, getting three or four times as much power out of the coal as does today’s steam locomotive. (Built experimentally by John I. Yellott of the Locomotive Development Committee, Baltimore.) There is no reason why this engine can’t be used to drive ship propellers and factory wheels. But why mine coal, haul it to factories, pollute the air and run up laundry bills? Why not burn it where it lies, pumping air down a pipe to keep the fire going, and collecting the fuel gas as it comes up another pipe? (Now done experimentally by the Alabama Power Co.) If oxygen becomes cheap enough, it could feed the fire to make richer gas, which might be distributed through pipe lines like oil, or burned at the surface and converted into electric power. That brings us to another great needâ€”an efficient method of transmitting electric power over a thousand miles. However it may be arrived at, power decentralization is one of America’s most important goals. Aside from a military value that we hope will not be tested, it should contribute immeasurably toward promoting freer competition and providing more living space and recreational opportunities for everyone. THE man of 40 will live to be flabbergasted by new strides in transportation. Before long, robot planes with recording instruments will probably penetrate the transonic speed barrier, that mysterious region lying between 650 and 950 m. p. h. Will these pioneers pave the way for human flight at 1,000 m.p.h. or better, and if so, what motors and airfoils will be used and how will they behave at a slowpoke 400 m.p.h.? Planes have already reached speeds that rival the pace of their own bullets, and pilots who bail out have to be blown from their seats by explosives. There will come a time, determined by the length of the average journey between points on earth, when further speed will not pay. If you’re going on a quarter-mile errand, you don’t step up your car to 80, and we can apply such a formula to air distances and speeds. The future of really fast travel lies in the waste spaces of the heavens. A V-2 rocket has already been sent up 114 miles (White Sands Proving Ground, Dec. 18, ’46), and as Dr. Fritz Zwicky puts it: “We first throw a little something into the skies, then a little more, then a shipload of instrumentsâ€”then ourselves.” Restless man will probably throw himself at the moon, at Mars, and at other chunks of matter and return to write books about it. Experts report that it’s only a matter of mathematics, but first a few problems must be solved. While man’s body can safely travel at any known speed, with too sudden a change in speed or direction his more easily detachable components, like blood and entrails, proceed in an opposite, or tangential, line of march. The more efficient a rocket is, the more likely it is to annoy its crew in this manner, since it must lighten its fuel load by quickly turning it into driving energy. This may cause acceleration too rapid for health. A compromise is indicated, and research toward creating new fuels that will give more power per pound. If lightweight shields against radiation are discovered, atomic power may bring about interplanetary travel. To serve man best, earth-bound aviation will concentrate on economy, convenience and safety, with safety first. We have an array of toolsâ€”Ground Control Approach, Instrument Landing System, Loran, fog-dispersal methods, to name a fewâ€”that in some combination should make blind flying about as safe as taking a bath. For convenience, we need among other things a reliable low-priced helicopter. Maybe it will be driven by jets mounted on the tips of the rotors. Such a machine may sometime supplant taxi-cabs, ambulances, fire engines, cow ponies and crop sprayers. NEWLY developed tools for communication, when fully applied, will match comic-book dreams, just now we are beginning to move radio broadcasting from the noisy, crowded, low-fidelity AM band upstairs to FM, where music sounds the way it’s made and there is room enough on the air for thousands of stations instead of hundreds. The transition should be virtually complete in a few years. Beyond that lies a time when telephone and telegraph poles will be sold for firewood, and microwave relay networks (used experimentally by A. T. & T., I. T. & T., Western Union, General Electric and Raytheon) will cover the country, using wave lengths a few inches long to carry all oral and visual intelligence, including FM broadcasting, phone calls, telegrams, television and facsimile. Tiny radio receivers and transmitters, with circuits printed instead of wired (see p. 101), will be as common in pockets as fountain pens, with great savings in time, gasoline and shoe leather. In short, everyone may soon become accessible to everyone else, and that, too, is something for the thoughtful scientist to brood about. Will our descendants have everlasting teeth from drinking water containing fluorine? Man may hope for the conquest of his crudest diseasesâ€”cancer, rheumatic fever, arthritis and polioâ€”if he really wants it. But not while he spends two billions for a weapon and passes the hat for health. Fund-raising drives may warm the heart, but they are no match for carcinoma, -which is not sentimental. THE huge industrial metropolis, a fairly new development in man’s history, is one of his worst mistakes. The pattern of degradation is familiar: Real estate owners chop up dwelling units and create congestion, then those who can afford it move to the suburbs, leaving behind them run-down areas that yield low taxes. Then the city tries to stave off bankruptcy by floating bond issues, underpaying teachers and levying sales taxes. All the while, radial superhighway approaches are being built to jam the streets from curl) to curb with transient vehicles. As a result, the place isn’t fit to live in, and even its millionaires cannot buy the sunlight, clean air and recreation space that the village handyman gets for nothing. But cities can be excellent places for living, if we will heed scientific “visionaries” who are concerned with the needs of human beings. These may not be the answers, but cities will adopt plans equally revolutionary, or slide further into their morass of fiscal and architectural bankruptcy. WE MUST lessen the gap between the scientist and the rest of the world. The scientist is not a mysterious genius. He is an ordinary man with a highly developed respect for provable facts, who has learned accurate methods for sifting those facts from the chaff of conjecture, legend and wishful half-beliefs. The man who masters a balky furnace and the woman who bakes a better muffin are often unconscious scientists. People must come to a better understanding of laboratory men and their methods, for science plans our future and sends us the bills. When we don’t know how to read them, we sometimes get stuck. And that’s not all. History shows that it’s dangerous for members of a small, powerful minority to consider themselves universally misunderstood. If we don’t knock on their lucite towers and ask them to the clambake, a few ingrown fanatics may try to run the world on their own, and there will be a loud and final bang. The responsible scientist of the future will be increasingly concerned with social problems. When people say that a certain human dilemma lies beyond the scope of science, it is often more accurate to say that scientific analysis has not yet been successfully applied to it. Race prejudice is one of the most challenging fields for tomorrow’s scientists, and no one knows what physician, psychiatrist, anthropologist, eoologist or economist may discover facts that will help to end lynchings and ghettos. To what extent is race hatred a function of the income, occupation, nutritional status, dental condition and folk habits of the hater and the hated? Nobody knows. Science should explore the dark problem. Juvenile delinquency, venereal disease and assorted neuroses present more jobs for enlightened scientists. It is not enough to treat these maladies after they occur. What would be the preventive effect of subsidized early marriages? Animals mate blamelessly when they reach biological maturity. Homo sapiens is expected to wait until he gets a raise or a house to live in. What ills derive from his abstention, or from his guilt at violation of the social code? If a billion-dollar research project established facts leading to a 10% improvement, it would be the greatest bargain of the ages. Also, manufacturers might sell more refrigerators. The organization of our industry and agriculture has made us into a nation of movers. Trends in population movements should be anticipated, and practical methods should be adopted to ease the shocks of a family’s readjustment to the new locale. Today no enlightened corporation builds a big plant without considering the housing and transportation facilities available to its employees. What happens to the employee and his family when the plant shuts down or moves somewhere else is of equal importance to society. Today, scores of eminent scientists, horrified at the killing power of the splitting atom, are earnestly working to unite all peoples in a master plan to harness it in the service of life. We’d better help them, and do it fast. Once we have jailed this bloodthirsty outlaw, the same plan can be used to control other scourges, both man-made and natural. Man will then have a chance to ful-fill his destiny through science. Until then, we live by the skin of our teeth, awaiting the White Pillar of Doom. Well that’s certainly a depressing piece. It was all there in front of us, wasn’t it, in 1947. All the environmental problems, all the social issues – we knew it all, we saw it coming. And we did nothing. Of course, I still don’t understand the thing about selling more refrigerators. He was making a tongue-in-cheek reference to how subsidized marriage would enable couples to get the homes they need earlier. Actually it’s good to see a futurist article that’s not only well-researched, but thoughtful as well.